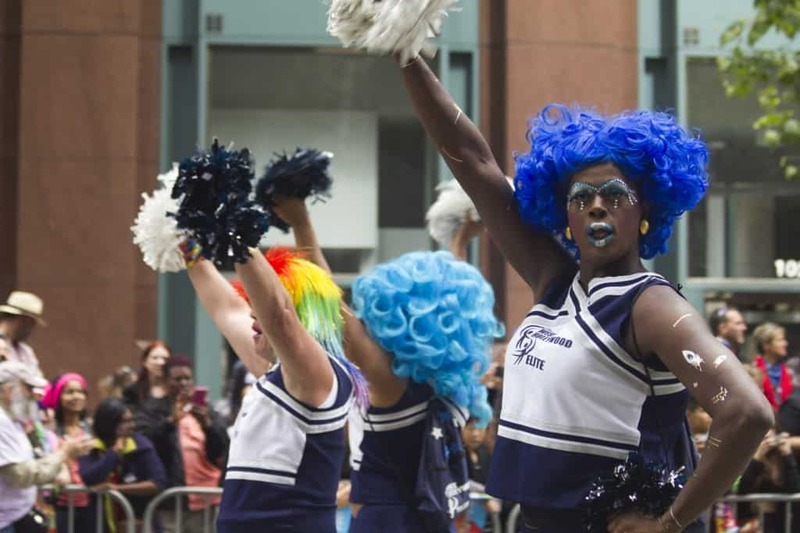 Los Angeles is often regarded as a gay-friendly place though the city certainly has neighborhoods and pockets where LGBT people feel more comfortable and welcome than others. 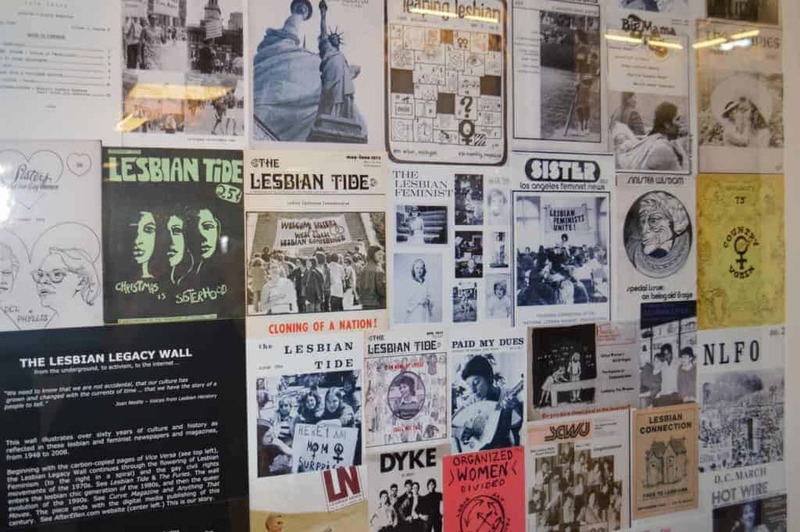 West Hollywood is the neighborhood within the LGBT community and it has a history of welcoming people of all walks of life. It’s technically a separate city with just 1.9 square miles within greater Los Angeles County and it’s a fashion forward and trendy place to live, work and visit within the sprawling city. We visited West Hollywood back in April and had a blast at some amazing hotel bars, late night hangouts and restaurants. But before you plan your trip, here are a few things you should know before you visit. West Hollywood wasn’t always a separate city. In fact, it started just as a neighborhood of Los Angeles and was originally called Sherman. The name later changed and then in 1984 officially became the 84th city of Los Angeles County. Since the early 1900’s the neighborhood was a huge hub for motion picture studios. In 1925, West Hollywood got its name and was considered one of the swankiest, most glamorous nightlife destinations. The Sunset Strip was created early in the 20th century and in the 1920’s became a major destination with the rise of nightclubs and speakeasies fueled by prohibition. West Hollywood even influenced Las Vegas and the city’s developers named the Vegas main street “The Strip” inspired by the Sunset Strip in West Hollywood. West Hollywood, or more commonly known as WeHo, has an extremely concentrated collection of LGBT residents and LGBT-owned business. The neighborhood has an incredible 25 gay bars, 26 gay shops and 69 gay friendly restaurants and counting. According the latest census, 40% of WeHo’s population is made up of gay men alone. There are other popular areas of LA like Silver Lake or downtown, but West Hollywood is the main draw for gays. Some of LA’s most popular and trendy hotels are located within West Hollywood’s boundaries including favorites like The Andaz West Hollywood, The Mondrian, The Standard and The Sunset Tower Hotel. All four of these properties offer an amazing stay, many with a long history of movie stars and major events. 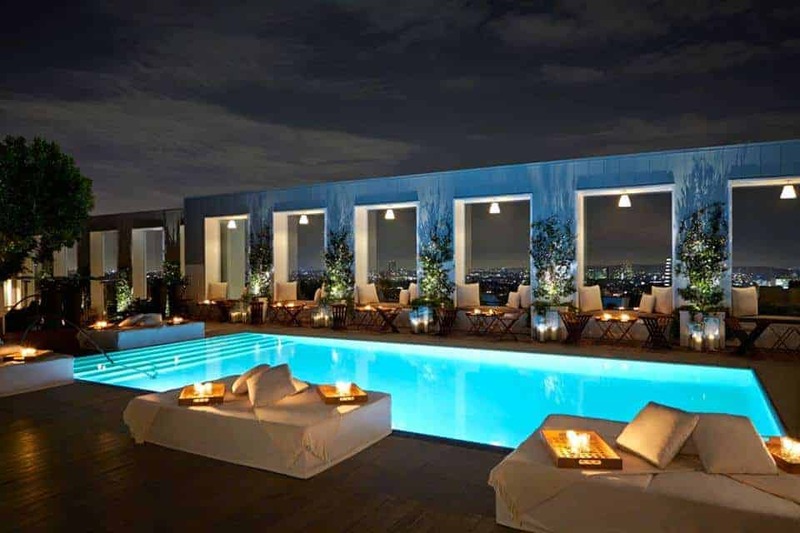 Several offer great rooftop bars with amazing atmospheres and views like Skybar at The Mondrian and Tower Bar at The Sunset Tower. West Hollywood hosts some of the best events in all of Los Angeles. The largest Halloween celebration in the US takes place here complete with food, entertainment, music and contests full of outrages costumes. More than half a million people attend this massive event. Other big events include Los Angeles Gay Pride, the HBO Emmy Party, Sir Elton John’s Annual Oscar Party, the Vanity Fair Oscar Party, The Rose Parade and Outfest, the longest running LGBT film festival in the country. If you have a passion for shopping then West Hollywood is the place to do it. The West Hollywood Design District is full of shops and boutiques of all types. You can’t go wrong with more than 300 different businesses in this small area. You can even find options here if you’re on a tight budget. Try visiting Out of the Closet, a thrift store located in West Hollywood which offers designer clothes at ridiculously low prices. Even better – all proceeds go to the AIDS Healthcare Foundation Pharmacy so you can feel good about your purchase. 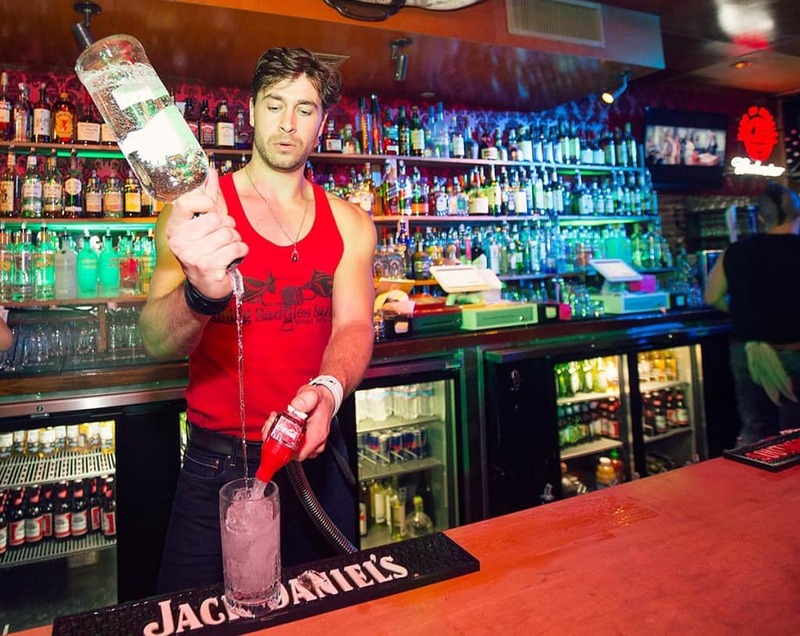 West Hollywood is one the most popular neighborhood for gay nightlife is all of Los Angeles. With 25 gay bars packed within less than 2 square miles it has an extensive offering in a compact space. Plus, if you plan on going out you can ditch the car to avoid risk of a DUI. The Pick Up is WeHo’s Free Nighttime Ride with bus service every 15 minutes. It does a 6 mile loop around the neighborhood so you can drink and party until your heart is content without worrying about transport. Service normally operates Friday and Saturday from 8pm to 3am. Some popular venues in West Hollywood include The Abbey (an institution), Flaming Saddles, GYM Bar, Here Lounge, Revolver and many more! 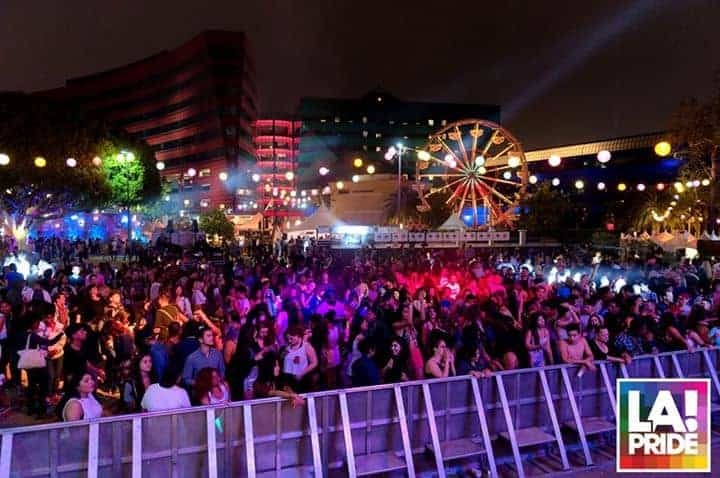 This is where LA’s trendy gays come to play and you’ll find most on or centered near Santa Monica Boulevard – the heart of the LGBT nightlife scene. Pump Restaurant Lounge has been one of the most anticipated restaurants recently opened by Real Housewife, Lisa Vanderpump. This restaurant serves up delicious food and drinks by even more delicious servers. There are many more amazing restaurants and cafes of all food types and styles including popular places like Laurel Hardware, Gracias Madre, Connie & Ted’s, Eveleigh, RARA by Drai’s Lucques, Comme Ca, The Church Key and Cecconi’s, a classic Italian restaurant. For more casual options try places like Marix Tex Mex Café ($8 all-you-can-eat Taco Tuesdays), Mel’s Drive-In or even The Abbey for tasty bites. Have you visited West Hollywood before? Which activities or events seem the most interesting to you? Let us know in the comments below. Note: this article was sponsored by Visit West Hollywood but rest assured all opinions are 100% our own and we don’t sacrifice our integrity for a sponsorship. We only promote those destinations that we genuinely enjoy and recommend. Featured image taken by Alan Light via Flickr / CC BY. Thanks for the info – I will need it Friday.